I’m really happy with most of those but the shoulder press and the chest press is lagging behind. The exercise might need tweaking a little to improve those areas. after reading a little about this on the web, i decided that my rear delts had been neglected in favour of the more prominent and visible front delts. all too often, athletes will favour the front and middle delts but miss out on the rear delt. which is hidden behind the shoulder joint. the front delt is involved in a lot of exercises involving abduction. it’s a synergist to the pecs and even to the triceps when performing dips. it’s also extremely easy to target when doing front raises. the rear delt however is harder to target, also because everyone is so obsessed w isolating lats. rear delts will rarely engage if lats are involved. for ppl who know about skinning the cat, rear delts are the primary hyperextensors for the shoulder. – barbell rear delt raise. a very interesting exercise, tho i find you need a lot of weight to feel anything and the rom is deceptively short. it seems impossible also to avoid elbows flaring out while doing it. -seated dumbbell lateral raise. very hard but oh so satisfying. this move is king for rear delts. it can also be performed standing while leaning the upper body forward, or even lying on a bench. however i prefer this version, mostly because a magazine once described it as “the move which will make you more 3D than avatar”. 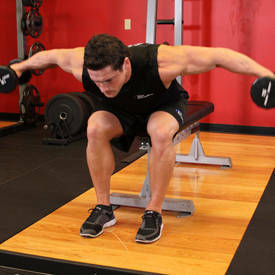 -for those who have access to a pec deck machine and can do reverse flies, this is also a very good exercise. however be very careful to keep elbows up to avoid involving the lats! if this is a problem, the trick is to use a thumbs down grip, that will force the elbows to be at the same height as the shoulders.